This conservation resource was created by Rachel Chew; Rachel Saltoun Karasenty; Kiran Sandhu; Rachael Thain. It is shared under a CC-BY 4.0 International License. Crocodiles have been around on this planet for some 200 million years , but since humans began hunting for crocodile meat and skin post World War II, the wild populations of these species quickly became quickly on the decline . Crocodiles are hunted to be made into luxury items such as leather shoes, handbags, watches, and wallets that are highly sought after and thus hold a high market value . Excessive hunting is a big problem for crocodile species because it takes a long time for these populations to mature. As explained by National Research Council, crocodiles’ “age distribution is like a pyramid”. This means that very few breeding animals dominate a large number of young juveniles, which are not prone to survival. Because many crocodiles die off before maturity, if the breeding crocodiles are killed, the population can dwindle drastically . Female crocodiles do not breed until they are at least 8 years of age, further increasing the duration for a crocodilian population to rebuild . In addition to overhunting, habitat loss and destruction as a result of human activities such as the drainage of swamps and wetlands or the construction of dams, also play a role to population decline . Endangered species include, but are not limited to, the Saltwater, Freshwater, Nile, as well as the Siamese Crocodile that are native to Australia, Africa, and Southeast Asia respectively . This global decline in wild populations brought about issues regarding conservation surrounding the species, which led to the idea of farming and breeding crocodiles in captivity . In the early 20th century, crocodile farms first started out in the form of Zoological Parks that double-served as tourist attractions. Since then, the first stand-alone crocodile farms were established in South Africa in the 1960s in attempt to help restore the crocodile population that had been driven to near extinction from overhunting . Because of increasing demands for crocodile skins and meat, other regions in the world, including China and Australia, also began the practice of crocodile farming to meet demands without furthering the decline in wild populations . According to Blake and Loveridge , the conservation of crocodiles in developing nations may be considered an incentive to maintain a renewable resource rather than to continue the exploitation and depletion of the current populations. The efforts allocated towards these conservation methods have been met with exponential success in increasing crocodile numbers. The focus of this Wiki page is the practice of crocodile farming in Papua New Guinea due to their success. Crocodile protection has led to its own set of problems, which will be explored through a case study of the Nile crocodiles. This will further emphasize the benefits of crocodile farming in terms of population control as well as a healthy relationship between local people and governments. Papua New Guinea (PNG) is located in Australia, bordering Indonesia. It is the 55th largest country in the world . In 2012, the reported population was 6,310,129 . Crocodiles are a cold-blooded species, so their functioning heavily depend on their environment and its climate . PNG crocodiles situate in river channels and floodlands . The humidity of the tropics result to large areas of wetlands and swamps that cover a large chunk of the lands. Currently fifty communities along the Sepik River in Papua New Guinea have begun a wetlands management initiative that has been bringing about income for the local populace . This initiative works by sustainably harvesting crocodile eggs from nest sites, which are then sold to a commercial crocodile egg retailer as a guaranteed return . The egg collection and crocodile farming combined not only generate income from producing skins for trade and export, but also raises the awareness of wetland values and stresses the cultural importance of crocodiles to the community . There are instrumental and intrinsic values to conserving the crocodile population . In regards to instrumental value, there exists economic advantages to this industry, such as monetary benefit that comes from products made from crocodile skins. Additionally, crocodiles provide direct and indirect environmental services such as clean drinking water, erosion aversion, and increasing the efficacy of local fishing operations . Although crocodiles have the role of the predator in wetland systems, the presence of them also increases yield of fish in the ecosystem, as they eat fish in poor health more than they prey on healthy fish. By doing so, they improve the health of the fish population; in addition, there excretions serve as a nutritious source of feed for fish. As crocodiles are a keystone species, the conservation is especially important to maintaining ecosystems that provide a refuge for aquatic life such as fish, frogs, and snakes . On the other hand, Ploeg et al. states that intrinsic values emphasize the value of species as “ends-in-themselves” despite their use to human beings. This means that the inherent value of crocodiles is already a good enough reason for them to exist; like us, they exist, thus they have value. Economic values are the focus of most conservation policies . Because developing countries cannot afford to compromise economic losses with environmental gains, an approach of a “best of both worlds” situation is required for local support. In PNG, juvenile crocodiles are sold to commercial crocodile farms, which generate income for the locals and also helps protect crocodile nests . Another example of conserving crocodiles for instrumental economic values is the use of crocodiles to bring in money through tourism . This is seen in northern Australia, where the “tourist-dollars” serve as an incentive to protect these species . As a result, a "best of both worlds" relation is established between wildlife conservation and economic gain for local communities of Papua New Guinea . These farms have become the main source of income for some communities . For the people of Papua New Guinea, the value of crocodile does not come solely from the sale of the hide - the crocodile also offers white, low fat meat which is in demand all over the world, including Paris . Under the laws of PNG, those who own the land are the ones who own the crocodiles and other wildlife located on their property, and 95% of PNG is still under traditional ownership . The citizens residing in areas of high crocodile density also hunt them traditionally for meat and eggs as part of their cultural cuisine, so the conservation and farming of crocodiles would directly impact them. . Moreso, the Sepik and Fly River peoples of PNG have a spiritual connection to the crocodiles and live in harmony with them, so handling them is not a strange concept for them . In the East Sepik region, there is an annual crocodile festival which is meant to increase the enthusiasm among locals about the conservation of this creature, as well as create opportunities to learn about the importance of sustainable development . The Chambri Tribe, the more well-known of the group of many tribes called the Crocodile People, believe that humans evolved from crocodiles . Part of the initiation ceremony from boyhood to manhood entails the boy undergoing an exhaustive ritual of song and dance, before the ceremony of cutting. This is when the boy's skin is pierced in a way so that the scars resemble their ancestor, the crocodile . It is suggested to visit the Yenchen tribe when travelling to PNG during the festival of the Crocodile to watch the famous Crocodile Dance . Many of the areas that crocodiles inhabit are near lowland communities where the land is not suitable for other forms of agriculture; crocodile skins are some of the only saleable items from these areas . Villagers were not initially attracted to the idea of raising crocodiles due to a multitude of reasons. One of these includes the fact that these crocodile pens requires a lot of space, and the crocodiles themselves need a lot of care . Furthermore, despite the government’s efforts, there is still a lack of information about how to care for and handle the eggs, which is important as these eggs can be killed with careless handling . There was some initial hesitation, but the sustainability of this project has been proven to be successful from a conservation perspective, as well as the villagers. The prosperity of this project inspired the Japanese government to provide more funds to the UNDP in order to continue this effort in Indonesia . To replace the “indiscriminate and wasteful hunting” of the wild crocodiles for skins by raising the crocodiles in the farm from when they are small and young to when the mature to commercial (full) size. To ensure that the resource is managed for the long term and to produce a sustained yield of crocodiles for the future. To ensure that these goals are met, the government has set many regulations regarding crocodile rearing. Recognizing the relationship that some villagers have with the crocodiles, the government passed legislation in 1969 that made the villagers the driving force that helped to save the population . This law did not ban hunting, but it banned having a skin that was larger than a specified size, which prevented the hunting and killing of breeding sized crocodiles, allowing for future harvest . One could still kill a crocodile if it attacked, but the skin of that crocodile was not saleable. As a supplement to this legislation, further legislation was passed in 1980 banning the sale of small skins . Now, if someone wanted to sell crocodile skin, they were forced to raise a crocodile until it became medium sized on their own farm . The Papua New Guinea government had the support of the United Nations Development Programme (UNDP) financially, as well as the Food and Agriculture Organization of the United Nations (FAO) . Much of the training as well as the resources offered to those farms were provided through these organizations. By the end of 1989, there were four large scale farms established, each of which had about 4,000 alligators at the time . As long as a market for crocodile skins exist, there will be reason to continue to farm crocodiles . With the support of the UNDP, the government offers themself as a resource to crocodile farmers, clearly encouraging and supporting these conservation efforts. Wildlife officers teach the villagers how to farm crocodiles, help set up the pens and teach how to care for them ;. To further help a farmer enter the crocodile farming business, the government could provide up to a $50,000 USD loan to help get started . The Wildlife Division provides guide books as well as has four demonstration farms where a farmer can learn how to “build pens, feed and care for the crocs, skill and skin and prepare hide for the market” . These local farms were geared to be more of a holding pen for the crocodiles, ensuring that they were not excessively hunted . The crocodiles were then transported to the commercial farms. This made a huge impact on the locals because they were previously being paid very poorly for the illegal hunting of crocodiles, whereas with this new set up, they were able to make up to $10,000 per year . A great example is from the city of Pagai, where there were less than 250 residents . Previously, the only major source of income was from dealers who paid extremely low amounts of money for the locals to illegally hunt the crocodiles and encouraged the wasteful killing of the animal . Since the conservation efforts started and became economically viable, locals began to instead capture the young crocodiles and raise them in holding pens. When enough were collected, they were delivered by plane to the large scale commercial farms . In one year, villagers were able to supply about 1,000 crocodiles, earning about $10,000 USD . Each village then pays a certain percentage to their established crocodile cooperative, which ensures fair prices for the crocodiles. These funds generated by the cooperative in turn have been able to fund the building of a school, a medical building and a church . The success of the crocodile farming industry would effectively make crocodiles a regional and national asset to Papua New Guinea, as well as increase their foreign exchange earnings . Luxury fashion brands such as Louis Vuitton and Hermes have created a distinct market for exotic skins such as crocodile. The global market of luxury accessories is worth more than $77 billion and of that, handbags represents a significant portion . The price point of a designer handbag is generally in the tens of thousands of dollars, however, handbags made from exotic skins can demand more than 30 times the price of an “ordinary” designer handbag . The need luxury brands have generated for high quality skins has left crocodile farmers scrambling to keep up with what they describe as “massive over demand” . The fact that it takes three to four crocodile skins to produce one Hermes bag has resulted in companies beginning to operate their own farms to manage supply . The process of farming crocodiles for the purpose of using their skins is a very particular and vigilant process. Any blemish or mark will significantly reduce the value of the skin. Farmers have studied and determined the ideal environment, factors and methods for raising crocodiles with clean, undamaged and high quality skin. From the initial stages of handling the eggs, farmers take great care in ensuring ideal temperatures and separating the crocodiles at the appropriate time until they are processed at around two and half years old . Especially in Australia, crocodile farms which sell their skins to high end luxury brands adhere to ethical standards and are approved under the Convention on International Trade in Endangered Species. This allows farmers to sell their skins virtually anywhere in the world and addresses the issue of legality which is a major consideration for companies purchasing the skins . Focused on building reputation, many crocodile farms dedicate their efforts to reducing their environmental impact and contributing to conservation efforts in order to attract ethical buyers. In terms of the fashion industry, crocodile farms have been the leading force in eradicating illegal poaching . Farming has also contributed to building back crocodile populations and controlling them at a healthy level. 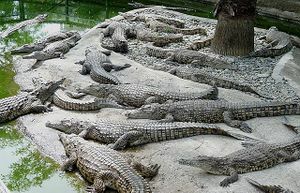 Major luxury fashion brands are a significant player in sustaining a growing demand for the crocodile farming industry. While crocodile farms generally function for conservation and skin processing purposes, tourism also represents a significant element in this industry . Opposed to viewing them in the wild, crocodile farms are an opportunity for tourists to witness crocodiles up close, in a safe and regulated facility. Feeding, observing and holding young crocodiles which have just hatched are all part of the experience which has boosted tourism in this industry. Many farms even incorporate performances involving the crocodiles. Not only does this aspect of crocodile farming represent another stream of revenue and income for the farms but it also gives an opportunity for the public to become educated and informed. Crocodile farms in countries such as Zimbabwe and Thailand have been positively impacted by the demand from tourists . Overall, tourism has represented a steady and reliable element for many farms to incorporate. Unfortunately, situations regarding proper regulations and safety measures have raised issues regarding tourism in certain farms. Involvement from governing bodies and safety regulators ensures that tourism continues to be a thriving and engaging element of this industry. “Human-wildlife conflict occurs when the needs and behaviour of wildlife impact negatively on the goals of humans or when the goals of humans negatively impact the needs of wildlife”. Although numbers were severely depleted during the 1960’s due to unregulated exploitation, crocodiles have been able to recover substantially. Crocodile farming and conservation methods have had tremendous success. The inflation in numbers for the Nile crocodile has led them to be moved from Appendix I of CITES to Appendix II in 2005. However, a simultaneous increase has occurred in the human population in South Africa, especially Namibia . Regions of Caprivi and Kavango have some of the largest populations and highest growth rates in Namibia This has resulted in a larger population of both rural human settlements and crocodiles in this region, which has led to more conflict between these two groups . Problems faced by the people of South Africa include an increase in the need of fresh water due to development of these rural areas, which means many are going right to the freshwater source for replenishment. This has exposed many people to direct crocodile attacks . Aust, Boyle, Fergusson, & Coulson  conducted a study on the human-crocodile conflict in Namibia, and they have concluded that between 2001 and 2005, there have been 489 cases of crocodile attacks in this area, with approximately 6,864 cattle being attacked by crocodiles every year. Consequently, attacks on humans and their livestock has been a growing worry for the people of these rural African settlements, and especially in southeastern Namibia. Although the example of the crocodile is an exceptional case in illustrating what conservation efforts can achieve, these consequences must also be considered in the discussion. This example highlights the necessity of action greater than a ban, since the ban itself leads to a different set of issues. Subsequent methods to relieve the issues of conflict have been defective and unsatisfactory (see Remedial Actions). However, very few actions has been taken to solve this problem . These crocodiles are a protected species under the CITES Appendix and may not be killed to control numbers and methods allocated to neutralize this situation have been perceived as insufficient by local communities . This includes financial compensation to small communities for the destruction of their livestock from a non-governmental organization which is riddled with technicalities and insufficient funds. Additionally, efforts to cage in the crocodiles with wire mesh fences were taken up by the Global Environmental Facility, which have degraded due to rampant vegetation and animal trekking . The problems faced by the people of Namibia is a direct consequence of wildlife protection laws that lack related measures on how to control rising populations of wildlife and humans. They are facing these problems due to the rising demand on natural resources to support their growing population and the inability to control crocodile numbers. The conflict in Namibia contrasts the human-wildlife relationship of those in Papua New Guinea due to the lack of farming practices put in place there. Governmental establishment of a Wildlife Branch that parallels that of Papua New Guinea, implementing methods to control crocodile numbers, along with initiations in creating a unified relationship between governmental parties and local communities are needed in Namibia. With the demand for crocodile skins and meats and the decline in crocodile populations worldwide, various recommendations can be taken. Because farming crocodiles for high luxury fashion brands has become a profitable and rooted business, especially in developing countries, it is difficult to decrease the supply of crocodiles within crocodile farms . Because of its high demand, crocodiles are usually kept in tiny concrete pens that do not allow them any movement, even when efforts are put into attracting ethical buyers. Although crocodile farming helps prevent illegal poaching of crocodiles, and thus preventing the decline in wild crocodile populations, it still bodes social concerns in an animal cruelty and welfare standpoint. A recommendation would be to educate consumers on what they are purchasing and to decrease the reduce the demand for these unethical practices that arise from the demand for these luxury products. Studies have shown that crocodile farming can increase the commercial production of crocodiles while reducing the threat of over-exploitation . Because agriculture contributes to a country’s Gross Domestic Product (GDP), crocodile farming could lead to a contribution to its GDP, which can benefit and diversify the economy . With this in mind, the expansion of crocodile farming to other high density crocodile locations can provide more job opportunities for locals. Specifically, this will open up opportunities within farm operations, regulation, and farm related tourism. This recommendation of branching out these farms could foster economic growth in more rural locations. As exemplified by the conservation actions taken in Papua New Guinea, co-management practices are an extremely promising method in creating sustainable communities. Through governmentally funded endorsements, rural settlements are able to benefit from the wildlife around them and garner intrinsic appreciation for their local ecosystems . Additionally, it allows local citizens to participate in decision-making for their areas. Such methods would be especially beneficial in cases like the Nile Crocodiles in South Africa, where bans are enforced but advantageous relations are not realized. Initially starting as a solution for combatting declining populations, crocodile farming has developed into an established and well known industry. Crocodile farms are a wide-spread conservation and skin production method around the world. The development of these farms involves a broad spectrum of actors including local communities, governments, the luxury fashion industry, and tourism. There are many motivators or driving forces behind farming which has led to the implementation of government legislation and involvement from the UNDP. Clearly, human-wildlife conflict is an ongoing issue considering population levels but also the social and safety impact crocodiles have on their environments. Moving forward, governments and communities can work together to address social and cultural concerns without compromising the economic value of crocodile farming through co-management initiatives. ↑ 1.001.011.021.031.041.051.061.071.081.091.101.111.121.131.141.151.161.171.18 Template:National Research Council. 1983. Crocodiles as a resource for the tropics. National Academy Press, Washington, D.C.
↑ Medley, Cynthia (1970). "One Way to Halt Poaching-Gator Farming". The New York Times. Retrieved 2009-02-08. ↑ Millennium Ecosystem Assessment, 2005. Ecosystems and Human Well-being: Synthesis. Island Press, Washington, DC. ↑ McNeely, J A and Sochaczewski, P S. 1988. Soul of the tiger: searching for nature's answers in Southeast Asia, New York, NY: Doubleday. ↑ Mazzotti, F J, Best, G R, Brandt, L A, Cherkiss, M S, Jeffery, B M and Rice, K G. 2008. Alligators and crocodiles as indicators for restoration of Everglades ecosystems. Ecol Indicators, 9(6): S137–S149. ↑ 18.018.118.218.318.4 Bolton, M. (1978). Crocodile farming in Papua New Guinea. Oryx, 14(4), 365-369. ↑ Chenje, J. (1998). State of the environment reporting programme for the Zambezi Basin. Inception mission report. IUCN/ERCSA/Sida, Harare. ↑ CBS. 2002. Preliminary results from the 2001 Namibia population and housing census. Central Bureau of Statistics, National Planning Commission, Ministry of Health and Social Services, Windhoek, Namibia. ↑ 28.028.1 Fergusson, R. (2004). Preliminary analysis of data in the African human-crocodile conflict database. Crocodile Specialist Group Newsletter, 23(4), 21. ↑ Bulkan, J. ‘CAMPFIRE 1’. CONS 200. 28 February 2018.